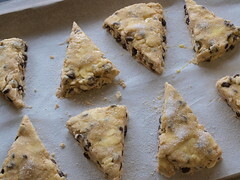 I might have been thinking of cookies when I made these scones. 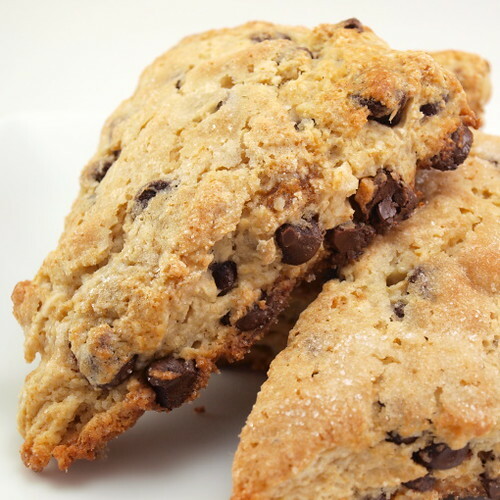 I was craving chocolate chip cookies the other day when a picture of some cream scones caught my eye. 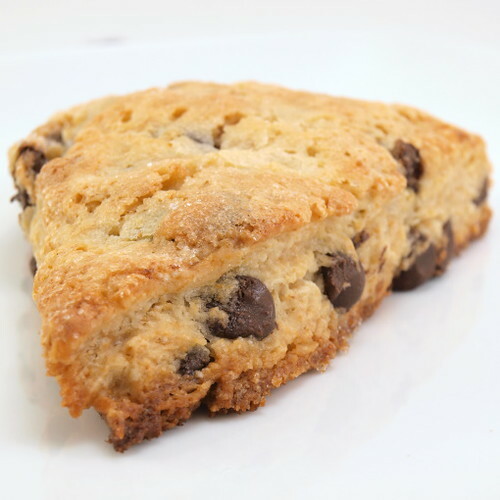 Why couldn’t I take the best flavors of a chocolate chip cookie and combine them with some scones? So, I did just that! 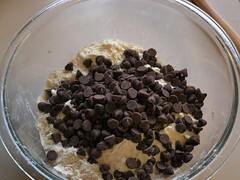 I used brown sugar in the dough and added a full cup of chocolate chips. I also added a teaspoon of vanilla. The results are spectacular! 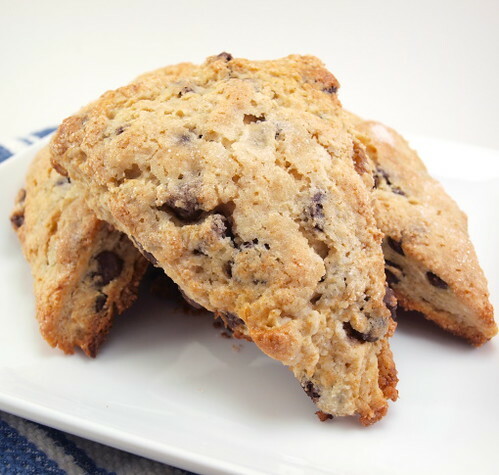 These scones have the warm flavors of chocolate chip cookies, but in a tender and lightly sweet scone. 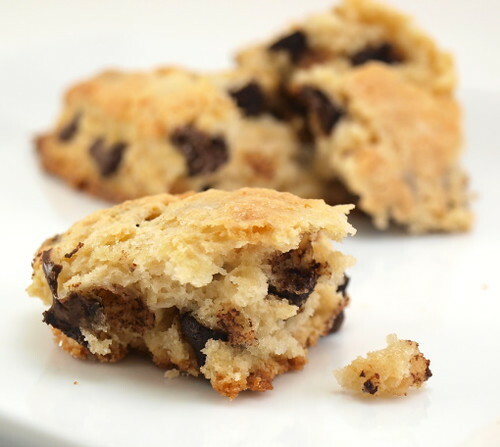 These make a great snack, breakfast, or dessert with a little whipped cream. Warm from the oven they are heaven. Heat the oven to 400 F and line a baking sheet with parchment paper. 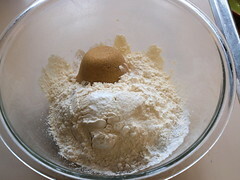 In a medium bowl combine the flour, sugar, baking powder, baking soda, and salt. 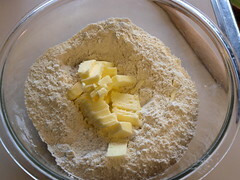 Add the cold butter and rub it in with your fingers until the butter is in small pieces, no larger than peas. 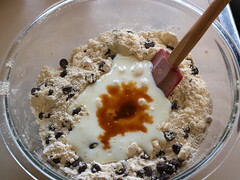 Add the chocolate chips and mix well. Pour in the cold buttermilk and vanilla and mix until the liquid is absorbed. The dough will look very dry and shaggy. 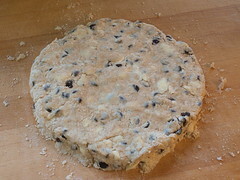 Turn out onto a cutting board and knead the dough three times by pressing the dough into a fat disk, folding the dough in half , turning it 1/4 turn and repeating. Do not over knead. Once kneaded press into an 8″ circle and cut the disk into 8 wedges. Places the wedges on the prepared baking sheet and brush with beaten egg. Top each scone with as much sugar as you like. 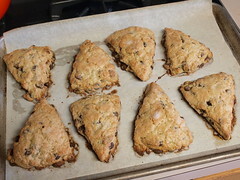 Bake the scones for 15 – 18 minutes, or until the tops are golden brown. Cool ten minutes on the pan before transferring to a wire rack.